However, the best time to visit Denmark is early summer, especially during the month of June when the days are long, and relatively warm weather allows for plenty of outdoor activities. ​June offers pleasant temperatures without the wet weather Denmark experiences in spring. All you'll need is a light jacket. In case June isn't an option, July and August are good alternatives for your visit, as Denmark still offers many outdoor activities and events during those months. Denmark is located in a unique spot between several different climate zones. In the Western part of the country, there is an Atlantic climate, while the Eastern parts of the country experience a continental-influenced climate. The country's annual rainfall varies wildly depending on location. Some parts of Jutland can receive more than 35 inches of rain per year, while the Great Belt between Jutland and Seeland may receive as little as 19 inches annually. Rain is most common from September through March, with September typically receiving the most precipitation. 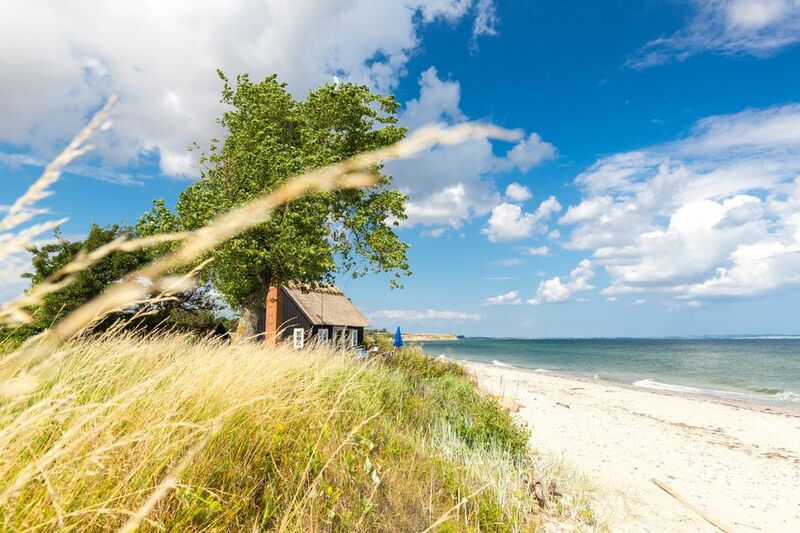 Not surprisingly, the southern part of Denmark is usually the warmest, with average temperatures hovering around 47 degrees Fahrenheit, but reaching as warm as 65 degrees Fahrenheit in the summer months. January is the coldest month across the country and snow, ice, and frigid winds are common. Snow showers are a possibility even as late as April. In the winter, days are dark and short but expect between 17 and 20 hours of daylight during the summer. Denmark is usually packed with tourists during July and August, so you may have to fight the crowds if you visit during these months. If you want to avoid the busy travel season altogether, May can be a good time to travel, when the weather is still mild enough for outdoor activities. Start your visit to Denmark by celebrating the country's Independence Day on June 5. Independence Day in Denmark is also called Constitution Day because it commemorates the anniversary of the signing of the constitution of 1849 (making Denmark a constitutional monarchy) and the constitution of 1953. Alternatively, if you want to party, take part in a massive rave festival, called Distortion, held in early June each year in Copenhagen. Spring is a popular shoulder season for visitors if you don't mind a bit of chill remaining in the air. Surprisingly, it's also drier than the fall months. You should still expect to experience some freezing temperatures through March. Temperatures can vary across the country, but typically average around 50 degrees Fahrenheit (10 degrees Celsius) in Copenhagen, and as high as 59 degrees Fahrenheit (15 degrees Celsius) on the Jutland Peninsula. Aalborg Carnival is held in late May. During this event, thousands fill the street dressed in colorful costumes, celebrating the victory of spring over winter. Ølfestival captures Denmark's passion for microbrewing and local beers. The country's largest beer festival takes place over three days in May. Denmark's days are long and pleasant from May through September. Expect long hours of daylight and everyone (Danes and tourists alike) to be outside soaking up the sunny summer vibes. July and August are the country's most popular travel months. If you're visiting during the summer, you can expect the sun to rise around 3:30 a.m. and not set until 10 p.m. (or later) at night. Viking Festival lasts two weeks each summer, as bearded Vikings perform Nordic sagas outdoors. The festival usually runs from late June through early July. Additionally, visit the Maritime Research Centre in Copenhagen where you can set sail through the Roskilde Fjord aboard a traditional Viking ship. Midsummer's Night is held country-wide to celebrate the longest day of the year. The festivities usually take place around June 21 and last well into the evening. Distortion is a five-day street party, celebrating Copenhagen's nightlife culture, particularly clubs and DJs. It takes place in June each year. Summer is a great time to hear the singing trees in Aalborg's Park of Music. Located in north Jutland, about four hours by car from Copenhagen, this park is home to trees planted by musicians who have visited the city. Visitors can literally push a button on some of the trees and hear tunes by such musicians as Sting, Kenny Rogers, Rod Stewart, Elton John, and the Vienna Philharmonic Orchestra. Fall in Denmark is quite cool and the weather can sometimes be a bit unpredictable. If you visit, be sure to pack a raincoat as this season's "outpourings," or heavy rains, are quite common. Regardless of the weather, the lines to visit the most popular attractions are much shorter than during the summer months. Temperatures aren't too cold yet, which means exploring outside, on foot or via bike, is still easily possible. Through late September, Tivoli Gardens host Fredagsrock at Plænen, an open-air Friday night concert. CPH:PIX is Copenhagen's feature film festival, which spans two weeks in September and October. The assortment of films includes selections from Copenhagen and abroad. Copenhagen welcomes more than 60 international art galleries each fall as part of its Code Art Fair. The event is held in September. Winter is time for the famed "hygge" season, that unique Scandinavian coziness that can't be experienced anywhere else. While the temperatures are cold, 'tis the season to experience the country's rich Christmas traditions or shop at a local holiday market. There is minimal daylight during the winter months: The sun won't typically rise until 9 a.m. and then sets as early as 4 p.m. Surprising to many, Denmark is not an incredibly snowy country—any snowfall typically dissipates within two or three weeks. The Tivoli Christmas runs from mid-November through late December. It's the country's largest Christmas market, with a huge selection of handicrafts as well as local food and drink. Try the mulled wine and æbleskivers. Jazz festivals are popular throughout Denmark, especially during the summer, but even in winter, fans can get their fix through Vinterjazz, a smaller-scale festival that takes place at intimate venues throughout the country.